Other than movies, Chennai peeps love sports. No, not just cricket. We are a little more than that. Whether you are picking up a new game or are looking to changing equipment that has worn over the years, you need a sports store. Here's where LBB will help you. Here's a list of sports stores around the city that you can go to for all your sports needs. Located right next to namma Chepauk Stadium, this store is perfect for all those cricket maniacs in the city. Not a cricket fan? Don't worry, they have a lot of sports good stocked that cater to other games as well. Swimming goggles, footballs, boxing gloves, carom boards, inner compression wear, and badminton rackets are just a few of the many goods you can hope to find. So finish that match and head to these stores to get your rackets and other sports equipment. This store might not have the best interiors but will for sure get you what you want in terms of sports. Footballs, basketballs, cricket and badminton gear, sweatpants, shoes, and all this begins from INR 500. How cool is that? Cricket, football, volleyball, basketball, what's your game? The merch here starts from INR 500. Tennis balls, corks, rackets, gloves, this place is perfect for those who love sports of all kinds. You can also get your old bat restrung, here. Hoard up on light cardio equipment such as skipping ropes, battle ropes, and resistance bands too. With so many branches across the city, Decathlon is not just a sports store. It is an emotion. Scuba diving to horse riding gear, cricket to football, they have gear for all the games you can think of. We love the products by Quechua, Asics, and the quality is unmatched. You also get mountaineering shoes, T-shirts, bottles, shorts, cycles, ropes, tents, everything. we repeat EVERYTHING! What is even more interesting is that the store predominantly employs salespersons who are athletes as they know the ins and outs of the sport they play and the equipment they use. Yenga Thala Dhoni ku periya whistle adinga! Yes, we magically hear these words when we step into Seven. A store that bleeds yellow with original CSK merchandise. There’s sports apparel, footwear, and accessories for both men and women, with an entire section just for CSK merchandise that’s all legit! Everything from flip-flops to joggers and match jerseys is available in the iconic CSK yellow. An exclusive badminton store, this tiny outlet on LB Road is a one-stop shop for all your badminton needs. From buying a racket to restringing one, these guys will do it for you and on a budget. They have different kinds of strings and they are priced from INR 400 onwards. 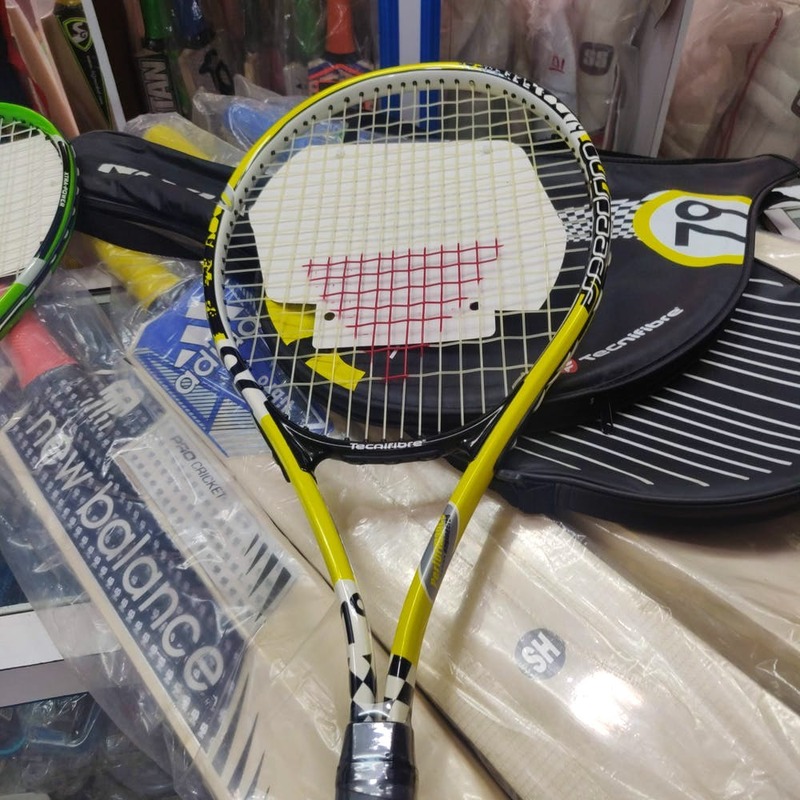 The rackets are also priced from INR 1,000. This sports store could be pretty special to a lot of people because this is where they bought their first bat or racket. We belong to that list too. Spread across a sprawling 4,500 square feet, their store has goods for all your sports needs. Besides just equipment, they also have after services and repairs for all that you bought from here.